Push On nose pads can be difficult to change when the pads become worn due to corrosion or general wear. This pliers make changing push on pads easy because of the unique jaw design. One jaw holds the guard arm, while the other jaw pushes the nose pad straight out of guard arm assembly. The advantage of using this tool is the guard arm is not stressed or bent during nose pad replacement. The chances of breaking a guard arm or having to readjust is reduced. 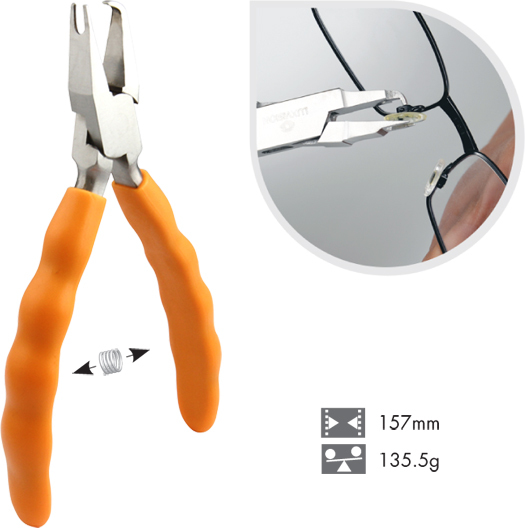 Pad Removal Pliers. An excellent Plier that effectively extracts old nose pads in need of replacing. Narrow jaws slip in tight areas when pad and guard arm are close to the eye wear and or lens surface. The precision design of this plier helps to snap out the nose pad without changing the alignment of the guard arm.